Is Trove a Shallow Grind? We have an official launch day for Trove now, July 9th. For me that means… not a whole lot. The game has changed quite a bit since I first started playing— it’s definitely fleshed out enough now to be considered a complete game—however without any progress wipes or fundamental gameplay changes shoehorned in prior to launch, I feel as though I’m already playing the “real” Trove; launch is just a formality. And with the announcement of Trove’s official launch, there was a little buzz about the game on Massively OP, current players discussing their experience with the game, potential players discussing whether they would try it out at launch, and disgruntled players bad mouthing the game simply because Trion is developing it. There were two subjects I saw mentioned a lot in the comments section that I’d like to shed some light on at least from my perspective, and that is Trove’s end game depth and grind. Not everyone likes the game as much as I do, and frankly some of the ones who dislike it have put far more hours into the game than I have. My opinion may change over time as well, I’m still a Trove newbie. I have yet to reach level 20 ( I did just ding 19 last night, woot!) and the highest level Uber world I’ve been to is U3. My professions are not maxed out and although I will soon be creating a club world to expand my building opportunities, my cornerstone is the pinnacle of my world building experience. In other words, I’m somewhere in the middle between curious outsider and seasoned insider and my opinion on the subject will reflect that position. Our milkshakes bring all the boys to the yard… and then crush them with waves of violent gummy worms. 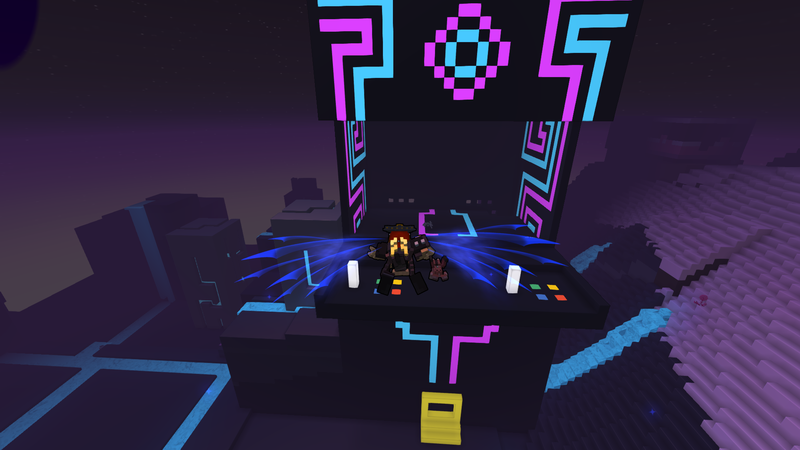 For those who read my post on collaborative multiplayer in Trove, this article is not the discussion on progression that I mentioned there, that will come later and will present several specific avenues of progression in Trove. Today’s post will be a general discussion in response to the numerous comments I saw in the Massively OP article complaining about Trove’s alleged lack of things to do at end game and extremely grindy gameplay. So is there a lack of depth to the end game of Trove? I think that depends on how much hand holding you prefer and what you are looking to achieve. It all comes down to expectations, and those can vary wildly, depending on the type of MMO you’re used to playing. A theme park MMO is one in which the developers provide a specific path for your character and then provide the tools necessary to reach the end of your predetermined journey. On the other hand, with a sandbox the developers supply you with a greater box of tools and resources but allow you, the player to determine what you hope to accomplish. This isn’t black and white, it’s spectrum in which most games lean toward one end or the other but most aren’t exclusively sandbox or theme park. Trove is somewhere in the middle but tends toward sandbox features, which is going to be a little uncomfortable if you prefer a theme park. But that’s exactly why I’m enjoying the game, I needed a break from the typical theme park MMO experience. I’m over the repetitive grind to max level followed by the hamster wheel of gear progression; I’m tired of approaching MMOs like a second job or a list of chores. I don’t always agree with Jef at Massively OP, but he was uncomfortably close to the truth stating that many MMO players are no longer playing for fun. I have been one of them. So in the sense that Trove does not have a fleshed out path of progression premade by the developers, it is shallow. If you approach this game as nothing more than another combat focused gear grind, you will burn out quickly. However I am not playing it that way and I don’t think the developers intend anyone to play Trove like a pure theme park. I have settled into an approach in which I slowly nibble away at the various progression paths made available while breathing deeply of the scenery along the way. It’s going to be a long time before I reach level cap on all the classes, exhaust all the crafting options, build the perfect cornerstone, collect all the decorative item recipes, or bring to life my club world vision. I have goals in mind for Trove, and they are goals I have set myself. And I’m enjoying the route to their completion so much that I’m in no hurry to check all the boxes on my list. In so many other MMOs I have been rushing through the leveling content or grinding up the tiers of gear because what I really wanted to do was at the other end. Conversely, my options in Trove don’t change a whole lot from level 1 to 20; there is no second game that starts at max level. For some that may seem shallow, for me that means I don’t have to rush; the only content waiting for me at the end is the same content I’m already enjoying. What about once I have reached the end of all my current goals? Will there be enough to keep me setting new ones? I’m not sure. Remember when I mentioned that a true sandbox has to have a much wider range of tools and resources to keep players engaged in creating their own reasons to play? Trove doesn’t exactly have that extensive toolbox in its current state, so yes, it is likely I will exhaust my options eventually if the developers do not continue to produce new content, preferably of the set-your-own-goals variety. You can do a lot with the tool set available, but we’re going to need a bigger tool box if Trove is going to have legs for the long haul. Yes, that’s a giant arcade game I’m flying toward with my pet dragon. Why do you ask? The other argument I saw crop up was that Trove has a lot of grind elements throughout the game. My answer to that is yes, yes it does. Holy crap does it ever. However I’m not of the opinion that this is (always) a negative thing. As for the grind itself, let me give you an example. I’m in the process of crafting my first mount, and I just about have enough Steed Feed to make it. Gathering the materials to grow the feed was pretty simple (once my gardening was level 150 which was itself a grind), but some of the other ingredients needed are going to take a lot of grinding. The other key ingredient requires that I have 500 bleached bones yet from all this time casually collecting them as I level, I only have about 130. Yikes. The same goes for gearing your character and then upgrading said gear in order to participate in Shadow Arenas of the highest difficulty level. Drop rates for the better gear is quite low, at least at the difficulty level I am playing in. And then gaining the materials needed to craft Shadow keys is quite time consuming as well. So there’s a lot of gathering grind and a lot of RNG grind when it comes to gear progression. But isn’t that true of any MMO? Crafting, gearing, collecting— all of this takes a significant time investment. 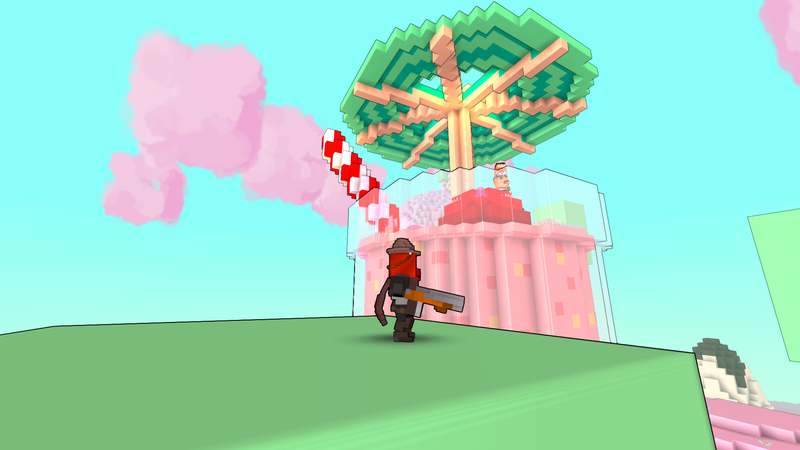 That’s why I am writing an article on progression options in Trove, right? Because those of us who enjoy MMOs like investing ourselves in a world with long term goals and gaining the sense of satisfaction from finally reaching those goals. It’s not the grind that turns us away from an MMO, it’s whether or not we enjoy the grindy bits that decides whether or not we stick around at max level. With that in mind, I’m of the opinion that Trove doesn’t feel grindy even though it does have a lot of grind involved in progression. This goes back to my approach to the game in general so your mileage may vary. When I’m playing Trove I do have goals in mind, but I do not blaze toward the finish line with blinders on the whole way. Whether I’m gathering materials, gaining XP, or earning loot, I do so primarily as a natural byproduct of exploring the procedurally generated worlds and dungeon crawling until my eyes bleed. Why do I do those things? Because they’re fun, of course! For the first time since my inaugural venture into World of Warcraft, I’m enjoying the gameplay of an MMO in and of itself and not enduring it for the sake of getting to the end. I’ve recaptured that sense of wonder and exploration and I’ve shed the obsession with spreadsheets, guides, min-maxing and theory-crafting. 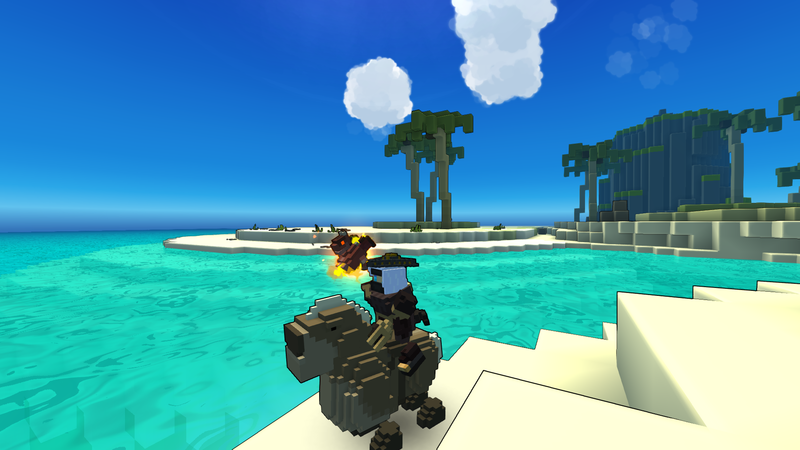 Which makes me wonder if it’s Trove that is so different from other games or if it’s simply that I have changed. Trove has certainly provided me with an environment in which I can play an MMO differently, I wouldn’t have made the playstyle shift in The Old Republic, WildStar, or Final Fantasy XIV. Those games are too similar to what WoW devolved into the longer I played. But I don’t think the gameplay of Trove is the only factor. It’s a bit of a “chicken or the egg” scenario, did the gameplay of Trove cultivate this refreshing change in approach, or was I already on the cusp of change and Trove happened to be the next game on my list? I think it’s both, Trove is an excellent environment for exploratory gameplay with little pressure to reach the end and I have definitely grown weary with the average theme park as of late. Ultimately, the two concerns discussed by the Massively OP readership are based on accurate observations of the game. Trove does not have the depth of developer driven end game content that most traditional theme park MMOs have, and the progression that is available requires a bit of grind. However whether this discourages or excites you has more to do with what mindset you bring to the game, whether you are looking for another pimped-out, gear-grinding hamster wheel to run or whether you’re wanting to smell a lot of roses along a short path in which reaching the end isn’t all that different from the way there. If World of Warcraft and similar MMOs are akin to a trip to Disney World (with their leveling experience comparable to the 22 hour drive it would take me to get there), Trove is more like a walk at your local park. I’m not saying there’s anything wrong with a trip to Disney, but sometimes it’s nice to have fewer places to be and fewer tourists to compete with along the way. Sometimes you’d rather wander around, explore both new and familiar paths, and draw some badass emberdrakes wearing top hats in the mud. Right, lol. That’s actually similar to why I’ve been playing so much rather than splitting my time between it and SWTOR. I haven’t been able to start playing anything until late and it’s such an easy game to dive right into. There’s less ramp up time or filler activites. However while it is good for short sessions, I think getting the initial momentum can take a while. I played it several times over months as the game developed during the beta and it was always fun but never gripping. But then when I stepped back in this time and started exploring a little further it really clicked. That’s why I’m writing so much on it lately. I’m really having fun with it of course but I also want to give other people a broader glimpse into the game. More people might play if they knew what the game offered. It will likely always be a niche title, but it’s more than just a Minecraft clone and actually has a lot of really nice features, things I wish traditional MMOs would adopt.